Entering the market in 1990s, invented by Precor, elliptical machines (also known as elliptical trainers, cross-trainers or X-trainers) was a breakthrough in the fitness industry. An elliptical machine is a motionless fitness machine with which workout mimics stair climbing, walking, or running. It puts limited pressure on the joint, thus reducing injuries. As a result, this type of exercise machines is an ideal option for people with joint pain. It provides users with non-pressure exercise whose intensity differ according to the speed of the workout and the resistance set by users. Almost all cross trainers help users train both of their upper and lower body so that they can burn a large number of calories. So now, having been aware of the health benefits of elliptical machines, you may ponder which are the best elliptical machines. The five following cross trainers are the best ones, basing on different criteria. However, all of them have pros and cons. Let’s explore with us the five best elliptical trainers in this review article. A Schwinn 430 Elliptical Machine hasa dual track two LCD window systemwhich lets you watch 13 distinctive display feedbacks carefully. With aSchwinn Connect goal data monitoring, you can be kept updated about achieving your health goals. An outstanding feature of this product is that it has 22 different programs and allows 2 users to train at the same time, which motivates and challenges you whenever you work out. It has 20 resistance levelsadjusted to speedy high inertia perimeter weighted flywheel helpsthe workout to be soft and silent. Moreover, it informs you of yourcalories burned, time, distance and speed during your workout. Aten degree, six position manual ramp and large pedalsfunctions properlyto give you an enjoyable fat-burning workout. As security is our first concern, the machine is also equipped with a central frame support for a firm exercise. However, this machine is quite big and heavy, weighing more than 200lbs, so ensure that you spare room for it. The reason why we say that it is the best product for people’s pocket is that it provides users with almost all the basic functions of an elliptical machine despite its low price. It has a natural elliptical motion which helps alleviate the pressure on joint, large foot plates with ridges for you to avoid slipping. With two handles which moves in a back-and-forth motion, it offers you an intensive body exercise. Moreover, you can easilyadjust the tension. Its small size makes it possible to be installed in smaller homes. Nevertheless, the parts of this product are made from plastic, which is in danger of breaking during use. Apart from that it has no consoles, which may annoy many users since they have nowhere to place their book,mobile phone or MP3. 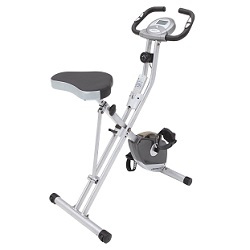 Thanks to its compactness and lightness, a Stamina In-Motion Elliptical Trainer can be put under a desk or in a closet and is suitable for home or office use. With low-impact design, it provides your back, knees, hips, and ankles with the best protection. Like many other elliptical machines , it has electronic monitor which helps you to keep track of strides, workout time, and the number of calories burnt. It is made from steel, which makes this product very strong and endurable. Moreover, it has non-slip pedals, which prevent injuries to a great extent. However, the most obvious con of this product is the lack of handles; in other words, it has only foot pedals, which means that you cannot train your upper part of your body. Furthermore, itrequires assembly. Many users have difficulty in this stage and often find it time-consuming. 20 workout applications designed by a certified personal trainer automatically adapt the machine’s resistance to your specific fitness goals. You can alter the shape and length of the stride, which measures up to 20 inches to train certain muscle groups and intensify your exercise. Moreover, you can change the resistance levels which range from 1 to 20 by just pressing a button. All of the aforementioned make you motivated and challenged all the time you work out. Last but not least, equipped with a 15 Ib, Inertia-enhanced Flywheel, it provides users with a soft and natural ride. Despite quite a few advantages which have been mentioned above, it has no fan, which may sound trivial but annoy many users and it is certainly better to have one. Why it deserves to be considered the best seller? It has some outstanding features and a reasonable price. First and foremost, despite only weighing 39 Ibs, it offers a durable platform for exercise with a steel frame and stabilizer bars. Secondly, it saves a lot of space, thanks to its ability to be folded and stored easily. Furthermore, it manages to satisfy a wide variety of users between the heights of 5ft 3 ins and 6ft 1 ins since it is equipped with a large and easily adjustable seat cushion. Finally, you just need to fasten the screws/bolts to enjoy a quiet and smooth workout. Nevertheless, this machine is just for beginners or people who want a moderate workout level, but not for professional athletes who are more familiar with the strenuous workout program. Generally, elliptical machines can be divided into three main categories which are front-drive, center-driveand rear-drive, , basing on the placement of the flywheel or the drive system that determines smoothness of the machine’s operation and its resistance. A “front-drive” is a machine with the flywheel in the front. An elliptical machine is called a “center-drive” one if the flywheel is in the center. Finally, the term “rear-drive” is used when the flywheel is at the back. All of the three types has their own features, both advantages and disadvantages. The rule is that the smoothness of the machine’s operation increases in proportion with the weight of the drive system. We have gone through the five best elliptical trainers reviews and their different types. We all see that their pros surpass their cons; therefore, you must have been persuaded to purchase one. Nevertheless, it is worth carefully considering everything before making a decision to buy. Our article onhow to be a wise consumer of elliptical machine might help you. In conclusion, all of the five best waist trainers have both advantages and disadvantages; however, the former seems to always exceed the latter and they all deserve to be considered "the best elliptical machines" in specific criteria. All consumers need to take everything into consideration in order to make a right decision on which one to buy.